I am a writer, performance poet and spoken word theatre maker, specialising in creating work for young audiences. 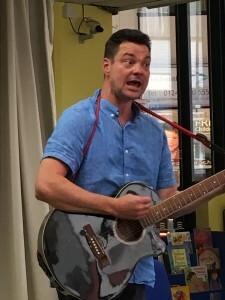 I have been writing, performing and visiting schools for over twenty years, offering an accessible and enjoyable high-energy poetry experience for children and adults alike. Recently I have focused on creating spoken word theatre shows for families including Young Herbert's Horrors, Big Wow Small Wonder (both solo with Half Moon Theatre), the OFFIE award nominated Boys Don't and One Way Ticket (Ensemble, Half Moon Theatre and Papertale Productions), Are We Being Silly? (Queens Theatre/Essex Libraries) and My Dad Is A Donkey (to name only a few) and have toured these shows to over 100 venues nationwide. My first solo collection for children THE DICTIONARY OF DADS was published in August 2017 by Otter-Barry Books. Well-received critically, it is currently on its second print. The follow-up THE MAGIC OF MUMS will be published in February 2020. I love working in schools and libraries and always try to be as flexible as possible with my schools offer. I work predominately in key stages 1, 2 and 3, but I'm happy to work with older and younger too. (I have performed in nurseries, worked in special needs schools, written poems with EASL students and run writing workshops with people with dementia). As well as one-off visits, I have also enjoyed working on longer-term educational projects with the likes of Hastings Pier Trust, Creative Partnerships and Glyndebourne Opera and the National Horseracing Museum amongst many others. Recent commisisons have included writing/performing a filmed poem about Railway Street in Chatham (where Dickens first went to school) for the Chatham Placemaking Project, a sonnet for a new housing estate in Ashford and "My Mate Margate", as part of the Cultural Olympiad in 2012. This year I am also looking forward to working with older people on a long-term Arts and Health project for Surrey Council. I was born on the Isle of Sheppey in Kent, but now live across the water in Southend-on-sea. I've been published in several poetry anthologies for children, including The Jumble Book (Macmillan), Born to Giggle (Save The Children), Recycling Grandad and The Secret Life of Pants (A & C Black). The Dictionary of Dads is my debut solo collection. Forthcoming solo poetry collection for young people 7 plus. Illustrated by Steve Wells and Published by Otter-Barry Books in August 2017.